Le Cercle Rouge (The Red Circle) is a 1970 crime film set in Paris, France. It was directed by Jean-Pierre Melville and stars Alain Delon, Andre Bourvil, Gian Maria Volontè and Yves Montand. It is known for its climactic heist sequence which is about half an hour in length and without any dialogue. Jean-Pierre Melville is considered as the “Godfather” of Nouvelle Vague. His movie involves an escaped prisoner, a diamond heist, a police manhunt and mob vengeance, but it treats these elements as the magician treats his cards; the cards are insignificant, except as the medium through which he demonstrates his skills. In fact, the Buddha said no such thing; Melville made it up just as he did with the epigraph in his also classic gangster movie Le Samouraï 1967. The photography by Henri Decae, althought is in color has the chilly effect of black and white. Peter Bradshaw, in a 2003 review, called the film a “treat” and noted “Melville blends the Chandleresque world of his own devising with gritty French reality. With its taut silent robbery sequence, his movie gestures backwards to Jule Dassin’s Rififi (1955), and with Montand’s specially modified bullets it anticipates Frederick Forsyth’s Day of the Jackal. 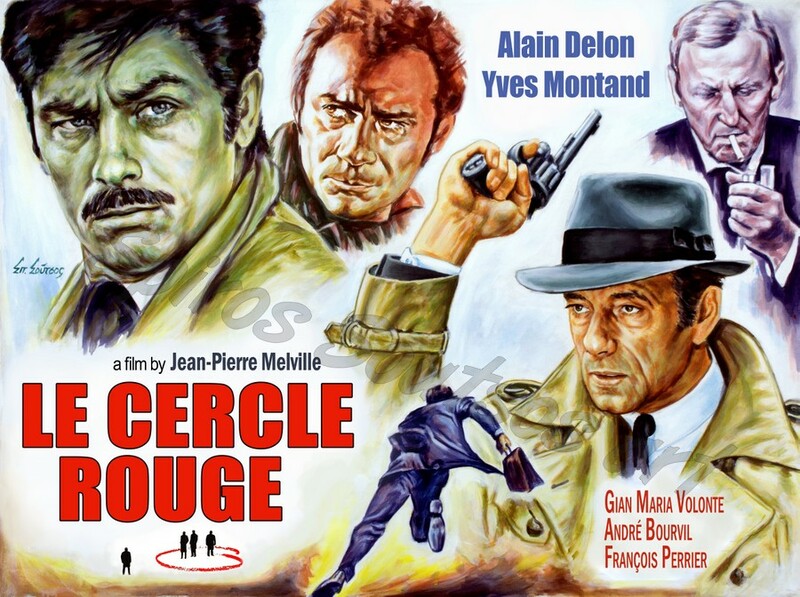 Jean-Pierre Melville’s Le Cercle rouge combines honorable anti-heroes, coolly atmospheric cinematography, and breathtaking set pieces to create a masterpiece of crime cinema.